Nothing like homemade bread bought in one of the many occasional markets organized during local celebrations in the great majority of towns around Barcelona city. Of course, bread is bread and maybe any bakery near you provides exquisite products but the good thing about these markets is that now that you bought the freshest bread you can combine it with other homemade stuff sold in the next stand, be it ham, anchovies, cheese or marmalade. Here is an interesting post that explains the difference between industrial and homemade bread: How to Make Your Own Tasty Homemade Bread, Easily and Cheaply. Delicious photo! Wish I could reach into the picture and pick a fresh loaf of bread!! I would love to have the ability to buy really fresh bread and then all the accouterments in an outdoor market. Nothing like fresh, homemade bread! 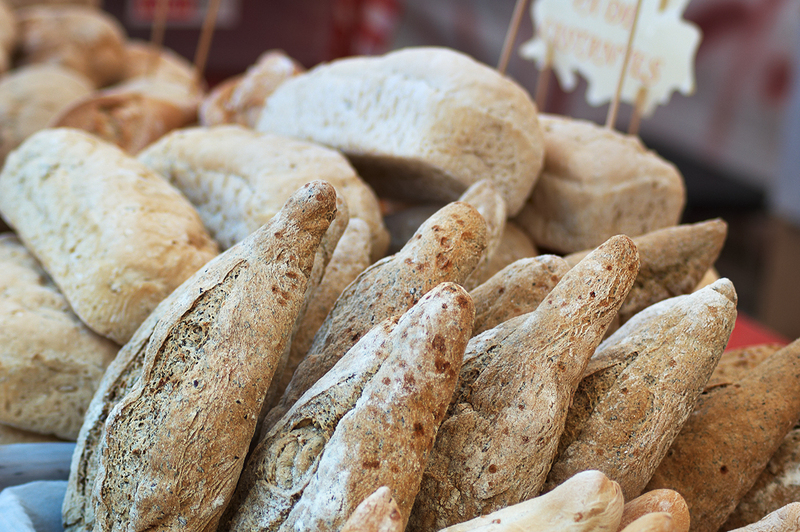 Our local farmers' market has a wonderful variety of homemade breads. Anything homemade is so tasty. Mmmm, wondeful photo. Can almost smell the warm bread.